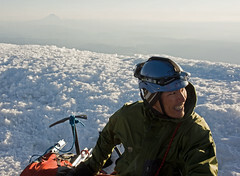 On Thursday, May 21, Trung and I decided at the last minute to go climb Mt Hood via the South Side/Old Chute route. I’d planned a larger climb for that night, but called it off on Wednesday, due to reports of nasty conditions and forecasts of rising freezing levels (icefall had been an issue recently). Then on Thursday afternoon, I heard from someone who’d successfully summited early that morning and had reported very good conditions. So the two of us decided to go. I ducked out of work a little early (not too early, though, since I had a couple of afternoon meetings) and headed home to quickly pack, glad that it doesn’t take nearly as much time as it used to to throw the pickets, ice axes, clothing, water, harness, helmet, gps, slings and biners, and a little food into my pack. I even had time to catch some of Henry’s baseball game before grabbing a couple hours of sleep. 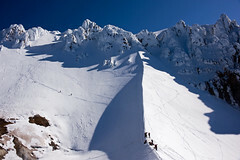 When we pulled into the parking lot at Timberline after midnight, I checked the flag hanging by the climber’s register. Motionless. A good omen. Temps were pleasant and right on the border between warm and cool. I chatted a bit with a guy who’d parked next to us and decided to climb Hood because, as a wind surfer, he’d always stared at the mountain while on the Columbia. He wasn’t terribly experienced in climbing. Are you going by yourself, I wondered? He laughed and said that’s how he rolled. Okay, be careful up there, and if you hear anything resembling icefall, duck, cover, and descend. Trung and I started hiking around 1 a.m., reached Silcox Hut about 40 minutes later, and the top of the Palmer snowfield between 3 and 3:30. The temps started dropping, the snow was solid and actually kind of slick in spots. We decided to crampon up at 7700 feet, and got chilled due to a cold layer of air hanging out there. This was when I thought we had a great shot at summiting, since the freezing level was clearly going to be low enough to keep the ice and snow solid higher up the mountain. 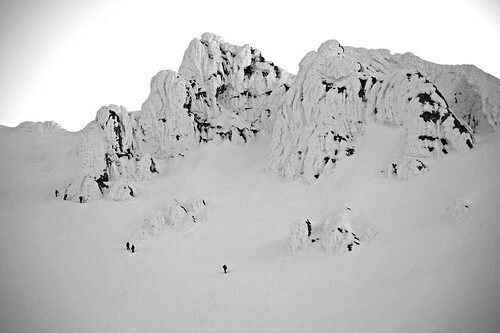 Our last climb of Hood was in January, when we negotiated ice underfoot from the top of the Palmer to Crater Rock. A very different story this time, with perfect styrofoam-like conditions. As we approached the Hogsback at 10,500 feet (at about 5:30 a.m.), there seemed to be quite a few people already lined up to summit via the Old Chute. Fortunately, we dilly-dallied while roping up just long enough and fears of a traffic jam never really materialized. There were a few, uh, interesting moments when light chunks of ice interspersed with golf balls would rain down upon us on the traverse to the Old Chute. A grapefruit-sized chunk of ice whizzed past Trung’s head, inches away from his face. Yikes. Once in the Old Chute, we had to pause momentarily to wait for other climbers, and were standing right in the crosshairs of a couple of bowling alleys spitting mostly pea-sized and smaller chunks down–one mountain-induced, the other climber-induced. A quick traverse and we were pretty much out of harm’s way and climbing our way to the catwalk that takes you to the summit. We reached the summit around 6:30 a.m., where there was not even a breath of wind. Fabulous conditions. I’m not sure if this climb makes the top five of all time, but it certainly was the best set of conditions I’d experienced on Hood in the few years I’ve been climbing. I wish they all could be like this.